Squabbalogic Independent Music Theatre's production of SONDHEIM ON SONDHEIM. Music and Lyrics by Stephen Sondheim. Conceived and Originally Directed on Broadway by James Lapine at the Reginald Theatre, the Seymour Centre, October 1 - 18. I loved my night at the Squabbalogic latest musical production, SONDHEIM ON SONDHEIM, an Australian Premiere Season, at the Reginald Theatre, in the Seymour Centre. This is a homage to the musical genius of the most influential musical theatre artist alive today: Stephen Sondheim - he must be in his mid-eighties, or so, now. Imagine! I always hold Mr Sondheim in the same reverential space as those other genius: Edward Albee and Tom Stoppard - all of the same vintage, or thereabouts. I saw it on its second night, the Saturday. I took a young woman who had never seen a musical before and she, too, loved it. She confessed to crying, laughing and been moved to reflect on the storytelling of so much of her , even though, young, life happenstances. She didn't know that songs could tell stories like that. She was so excited. So, this show is for everyone. The aficionados and the neophytes. SO, DO GO - don't miss it. SONDHIEM ON SONDHEIM is a combination of taped interviews and archival footage of Mr Sondheim, edited together, to inform, educate us, often wittily, about the life (an artist uses their life to make their art) and work methods, approaches, frustrations, to his magnificent output. Originally, it was conceived (and then Directed) by the long-time colleague of Mr Sondheim, James Lapine, in 2010, and appeared for a short run at Studio 54, for the Roundabout Theatre, in New York. To augment this very absorbing documentary approach, 8 live singers and a band of 9 musicians, led expertly by Hayden Barltrop, illustrate, with songs, from some 19 Sondheim shows, curated from a 62 year period of creativity. It includes student work (BY GEORGE -1946) right through to the latest work, GOD - a pastiche song of homage written, especially for this show. We hear of songs that were cut from shows (LOVE IS IN THE AIR, originally, the opening song for A FUNNY THING HAPPENED ON THE WAY TO THE FORUM (1962); SMILE GIRLS - a song cut from GYPSY (1965)), and parts of famous songs and not so famous songs, right back to WEST SIDE STORY (1957), DO I HEAR A WALTZ? (1965), COMPANY (1970), FOLLIES (1971), through to ROAD SHOW (2008), including all those shows you love, even if, as in a lot of cases here in Sydney, you have only ever seen them in devoted Amateur Theatre or Student Theatre productions. It is one of the tragedies of living in Sydney that so little of Mr Sondheim's work as ever had a professional production. Don't you think that a production of FOLLIES, never professionally mounted in Sydney, if Australia, should trump, Mr Teraccini's THE KING AND I or ANYTHING GOES (God Help Us, how many MORE times do we get to see these shows?) as a more challenging Opera Australia artistic enterprise? I do. Or that, say MERRILY WE ROLL ALONG or INTO THE WOODS or SUNDAY IN THE PARK WITH GEORGE might be more interesting than another THE ROCKY HORROR SHOW, or the boring repetitions of Mr Frost's organization, as we sit down, once more to GREASE*** or WICKED or ANNIE. Is it a wonder that some audiences have never seen a big musical show: they are old hat and sooooo familiar: THE LION KING, LES MISERABLES, are on AGAIN, and for sure THE PHANTOM OF THE OPERA, and even MARY POPPINS must be lurking somewhere in those hoary wing spaces of professional musical theatre company planning offices! - pots of gold, I suppose, if not artistic risk and exploration. Very different in tone to the cabaret feel of the very familiar SIDE BY SIDE BY SONDHEIM (1976), SONDHEIM ON SONDHEIM is a treat of musical theatre, and at over two and a half hours in length, a very generous 'helping'. Director, Jay James-Moody has also designed this production, and very, ingeniously slick it is, with strings of scrunched music sheets hung as curtains, back and sides, to form the background to the action centre of the white gloss floored stage space, masking the orchestra in the back area and providing convenient entrances and exits for the performers with a minimum of fuss, in the 'horrible' black box, one-door space that is the curse of the Reginald Theatre architecture. Simple wheeled black boxes with a lid to them, provide the seats and storage for the movement of the catalogue of songs. Above, at the back, is the screen that gives us the pleasure of getting to know, very personably, Mr Sondheim, himself, with the very, very arresting, absorbing video footage. The Lighting Design, by Mikey Rice, is glamorous, and the Sound Design by Jessica Jay-Moody is as impeccable, as it always is, with this company. Mr James-Moody has the ability to galvanize a production with the brisk attentive sensibility of occasion, and he handles his cast of very wonderful singers with grace, focus and generosity: Blake Erickson, Rob Johnson, Louise Kelly, Debora Krizak, Philip Lowe, Monique Salle, Christy Sullivan, Dean Vince. In ensemble the sound of these singers is 'beautiful' and stirring: COMEDY TONIGHT, SUNDAY, COMPANY, for example. Whilst I was impressed with the solo turns of Monique Salle's powerful, NOW YOU KNOW, from MERRILY WE ROLL ALONG and Christy Sullivan's TAKE ME TO THE WORLD from EVENING PRIMROSE. The simple choreography, movement, about the stage by Ms Salle, is economic and unfussy in its efficiency. On the 31st July, 1970, the old Her Majesty's Theatre, down in Quay St, not far from Chinatown, caught fire and burned to the ground - I was studying at NIDA, and I remember we were all in a state of mourning and apprehension, another Sydney Theatre gone. It was where I had seen CAMELOT, FUNNY GIRL, FIDDLER ON THE ROOF. In 1973, the new Her Majesty's Theatre opened with the latest Broadway hit: A LITTLE NIGHT MUSIC, by a young composer Stephen Sondheim. It was reviewed generously, but, really, did not capture the Sydney audience. The invention of Mr Sondheim had pushed the musical theatre form beyond what the Sydney audience could absorb at that time, I conjecture, as there had really been a four year gap since the fire, and the latest International musical had not shown itself in Sydney, and no proper 'bridging' had prepared Sydney for the enormous sophistication and change of direction that Mr Sondheim's work was heralding. It took the courage of the Sydney Theatre Company, under the aegis of a theatrical visionary such as Richard Wherrett, to attempt to redress our 'black hole' of ignorance, that we saw a Drama Theatre scale production of COMPANY, and, later, INTO THE WOODS. A SWEENEY TODD, with Peter Carroll and Geraldine Turner was presented at Her Majesty's Theatre in 1988, and Opera Australia have presented it twice, at least, firstly the Gale Edwards production with Lyndon Teraccini as the barber - scarred forever, perhaps, sir, razor in the air! - and again, in 2007, with Peter Coleman-Wright. 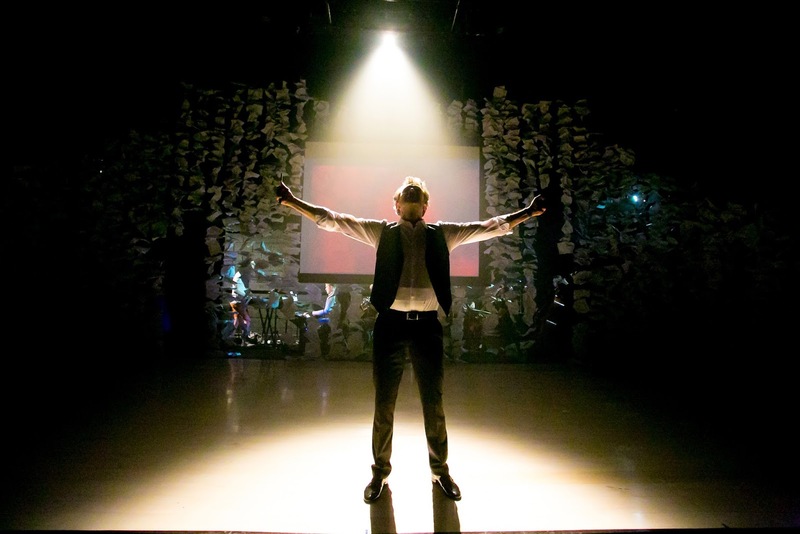 The Kookaburra Company gave us what was to become an infamous COMPANY production at the Theatre Royal, recently. No other major work of Mr Sondheim's has had a professional production in Sydney. Is all this true? I think so. And here we are in this scintillating, contemporary vital modern city, yes !? Très sophisticated. One of the great cities of the world!!!! Oh, well. Thank god for aeroplanes. For, I have seen, luckily, elsewhere, COMPANY, FOLLIES,A LITTLE NIGHT MUSIC, SWEENEY TODD, INTO THE WOODS, SUNDAY IN THE PARK WITH GEORGE, MERRILY WE ROLL ALONG and ASSASSINS. For those of you who haven't, then it is a work like the Sqabbalogic: SOUNDHEIM ON SONDHEIM, that you could be, should be devouring, to take you to musical places of bliss, and, hard though it is to say, without a humiliating gasp, to 'alternative' musical tastes. This is a first rate production of a very interesting 'review' of a great man's work. A must for us all. The sheer quality of the writing and the now familiar form of the musical invention of Mr Sondheim is worth every effort to embrace. Seeing the recent work RUTHLESS here, at this theatre, and being, faintly, appalled at the quality of the writing, lyrics and music, let alone the ideas of it (and knowing the loving response it had from some friends who just loved it), seeing this collection of, even rejected songs of Mr Sondheim's might put some standards of expectation into a perspective. The Australian efforts of new work at the Hayes Theatre: TRUTH, BEAUTY AND A PICTURE OF YOU; LOVE BITES, though important that they be written and produced and seen, pale in the shadow of such a legacy as Mr Sondheim has cast. The master craftsman is a must to experience, even on video, and especially when presented with such a committed cast of Australian performers, illustrating the work methods and the end results. Go. This company has produced CARRIE the musical, and THE DROWSY CHAPERONE to great esteem, and no less a lavish envisioning and manifestation is on stage at the Reginald at the moment. Squabbalogic is a first rate company. P.S. Do you know what endeared me to the sensibility of this wonderful collective, especially? On Saturday night, the Director of this show and the other two mentioned above - who was also the star of THE DROUSY CHAPERONE, Jay James-Moody, was standing on a box, in the foyer, selling the programs. Now that is a true theatrical and the kind of man who can make things happen and will be rewarded for his ethical and artistic enterprises.